Cardiorespiratory endurance is enhanced by aerobic training which involves activities that increase your heart rate and breathing such as walking, jogging, or biking. Building cardiorespiratory endurance through aerobic exercise is an excellent way to maintain a healthy weight. Working on this element of physical fitness also improves your circulatory system. It boosts your ability to supply the body’s cells with oxygen and nutrients, and to remove carbon dioxide and metabolic waste. Aerobic exercise is continuous exercise (lasting more than 2 minutes) that can range from low to high levels of intensity. In addition, aerobic exercise increases heart and breathing rates to meet increased demands for oxygen in working muscles. Regular, moderate aerobic activity, about thirty minutes at a time for five days per week, trains the body to deliver oxygen more efficiently, which strengthens the heart and lungs, and reduces the risk of cardiovascular disease. Strengthening your heart muscle and increasing the blood volume pumped each heartbeat will lead to a lower resting heart rate for healthy individuals. Aerobic exercise increases the ability of muscles to use oxygen for energy metabolism therefore creating ATP. Aerobic capacity, or VO2 is the most common standard for evaluating cardiorespiratory endurance. VO2 max is your maximal oxygen uptake, and the VO2 max test measures the amount of oxygen (in relation to body weight) that you can use per minute. 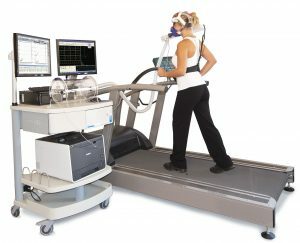 A test subject usually walks or runs on a treadmill or rides a stationary bicycle while the volume and oxygen content of exhaled air is measured to determine oxygen consumption as exercise intensity increases. At some point, the amount of oxygen consumed no longer increases despite an increase in exercise intensity. This value of oxygen consumption is referred to as VO2 max, ‘V’ meaning volume, and ‘max’ meaning the maximum amount of oxygen (O2) an individual is capable of utilizing. The higher the number, the more oxygen you can consume, and the faster or longer you can walk, run, bike, or swim, among other aerobic activities. VO2 max can increase over time with training. Muscle strength is developed and maintained by weight or resistance training that often is called anaerobic exercise. Anaerobic exercise consists of short duration, high intensity movements that rely on immediately available energy sources and require little or no oxygen during the activity. This type of high intensity training is used to build muscle strength by short, high intensity activities. Building muscle mass is not just crucial for athletes and bodybuilders—building muscle strength and endurance is important for children, seniors, and everyone in between. The support that your muscles provide allows you to work, play, and live more efficiently. Strength training involves the use of resistance machines, resistance bands, free weights, or other tools. However, you do not need to pay for a gym membership or expensive equipment to strengthen your muscles. Homemade weights, such as plastic bottles filled with sand, can work just as well. You can also use your own body weight and do push-ups, leg squats, abdominal crunches, and other exercises to build your muscles. If strength training is performed at least twice a week, it can help to improve muscle strength and to increase bone strength. Strength training can also help you to maintain muscle mass during a weight-loss program. Flexibility is the range of motion available to your joints. Yoga, tai chi, Pilates, and stretching exercises work to improve this element of fitness. Stretching not only improves your range of motion, it also promotes better posture, and helps you perform activities that can require greater flexibility, such as chores around the house. In addition to working on flexibility, older adults should include balance exercises in their regular routine. Balance tends to deteriorate with age, which can result in falls and fractures. Body composition is the proportion of fat and fat-free mass (which includes bones, muscles and organs) in your body. A healthy and physically fit individual has a greater proportion of muscle and smaller proportion of fat than an unfit individual of the same weight. Although habitual physical activity can promote a more healthful body composition, other factors like age, gender, genetics, and diet contribute to an individual’s body composition. Women have a higher healthy fat percentage than men. For adult women, a healthy amount of body fat ranges from 20 to 32 percent. Adult males on the other hand range from 10 to 22 percent of body fat. Being fit also includes metabolic fitness. It relates to the number of calories you require to survive and the number of calories you burn during physical activity. Recall that metabolism is the sum of all chemical reactions that occur in the human body to conduct life’s processes. Some are catabolic reactions that break down nutrients to supply the body with cellular energy. The rate at which a person burns calories depends on body composition, gender, age, nutritional status, physical activity, and genetics. Increasing your daily activity and shedding excess body fat helps to improve metabolic fitness. Physical activity also makes weight management easier because it increases energy needs and lean body mass. During moderate to vigorous activity, energy expenditure raises well above the resting rate. With continuous exercise over time, regular exercise increases lean body mass as well. At rest, lean tissues use more energy than fat tissue therefore increasing basal metabolism. 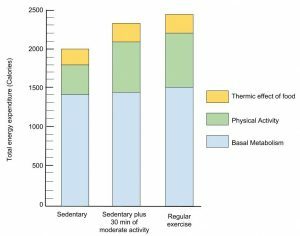 The combination of increased energy output, energy expenditure and basal needs over a long period of time can have a major impact on total energy expenditure (see Figure 16.2 “The Effect of Physical Activity on Energy Expenditure”). The more energy you expend, the more foods you are able to consume while maintaining a healthy weight. Any improvement to metabolic fitness is beneficial and means a decrease in the risk for developing diabetes, or other chronic conditions. One measurement of metabolic fitness is basal metabolic rate, or BMR, which is a measurement of the amount of energy required for the body to maintain its basic functions while at rest, i.e. breathing, heart beats, liver and kidney function, and so on. On average, BMR accounts for between 50 and 70 percent of a person’s total daily energy expenditure. Different factors can affect the BMR. For example, a slender person who is tall has more body surface area and therefore has a higher RMR relative to their body mass (weight). Also, muscle utilizes more energy at rest than fat, so a person with more muscle mass has a higher BMR. A second measurement of metabolic fitness is the number of calories burned during physical activity. The amount of calories burned depends on how much oxygen is delivered to tissues, and how efficiently metabolic reactions consume oxygen and, therefore, expend calories. One of the best estimates of energy expenditure during exercise is how much oxygen a person consumes. Recall that VO2 max is a measure of the maximum cardiorespiratory capacity to deliver oxygen to the body, especially to working muscles during exercise.. Greater VO2 max is indicative of better cardiovascular fitness. In contrast to RMR, VO2 max increases significantly with exercise training due to training adaptations that increase the body’s ability to deliver oxygen to working tissues and an increased capacity of muscles to take up and utilize oxygen. The CDC along with the American College of Sports Medicine (ACSM) have evidence based recommendations and guidelines for individuals to follow in order to obtain or maintain a healthy lifestyle. Adults should get at least 150 minutes of moderate-intensity aerobic physical activity or 75 minutes of vigorous-intensity aerobic physical activity each week. In addition to aerobic physical activity, it is recommended that adults do muscle strengthening activities on each major muscle group two or three times each week. Adults also are recommended by the ACSM to do flexibility exercises at least two to three times a week to improve range of motion. To learn more about these guidelines visit the CDC website at https://health.gov/paguidelines/guidelines/adults.aspx and the ACSM website at http://www.acsm.org/about-acsm/media-room/news-releases/2011/08/01/acsm-issues-new-recommendations-on-quantity-and-quality-of-exercise. The Essential Elements of Physical Fitness by University of Hawai’i at Mānoa Food Science and Human Nutrition Program is licensed under a Creative Commons Attribution-NonCommercial-ShareAlike 4.0 International License, except where otherwise noted.